I previously wrote about using Crayola Bathtub Crayons to capture ideas while in the shower. That idea fell into disuse as the other occupants of the home were displeased with seeing the writing on the wall. Also it was sometimes hard to read and to clean. 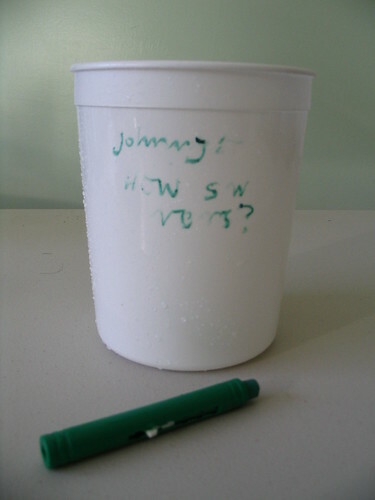 Here’s an idea that eliminates these problems with the crayons: write on a plastic container. You can write smaller and more legibly, and it is easier to clean. It may not be perfectly legible, but it’s good enough for you to remember what you were thinking about. posted by Jonathan at 10/03/2009 09:18:00 a.m.